Last Friday we kicked off our weekly Instagramarama photo series by featuring some cold and snowy captures from around the world. This week, we’re heating things up with steel wool photography. This type of photography is a form of light painting using fine grade steel wool, a whisk, and a leash for spinning. When lit up and spun, the steel wool creates a shower of sparks creating some beautiful and dramatic effects when shot with a slow shutterspeed. Of course for safety’s sake, it’s best to do this on sand, concrete or in wet — less flammable — conditions. 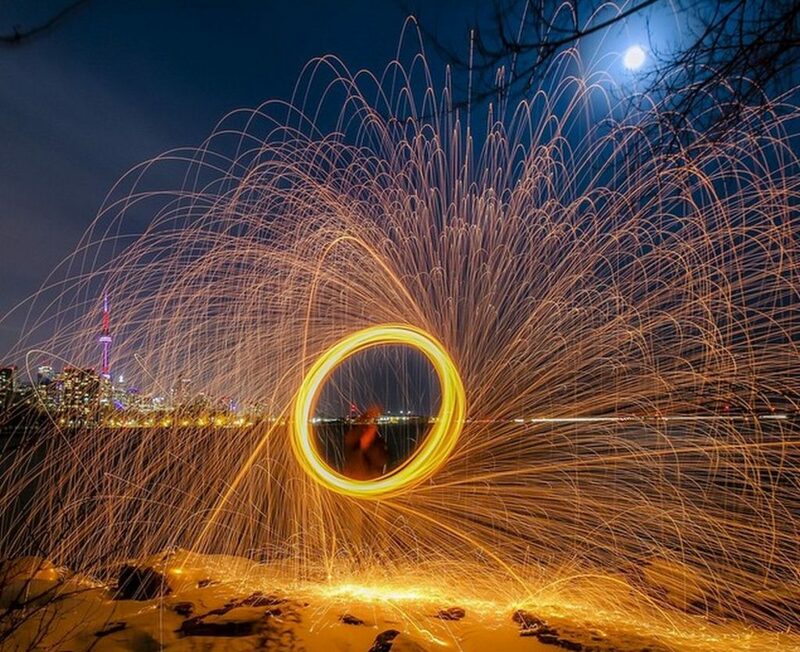 Check out our favorite steel wool spinners from Instagrammers around the world. On a bridge in Nashville. Beside a bridge in Toronto. Under the moon in Palu. Under a bean in Chicago. In a cave in Vladivostok. In a park in New York City. In an abandoned building in Montreal. Under the stars in Essex. In a tunnel in London.